The Genius of Scotland is an impressively thorough survey of the reception of Burns’s verse and the cultural context which shaped that reception. The first chapter explains the Scottish Enlightenment theories of ‘genius’ which Burns’s emergence was taken to vindicate. 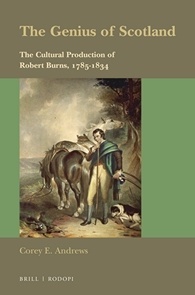 Subsequent chapters describe the flurry of reviews that greeted the Kilmarnock and Edinburgh editions of Poems, Chiefly in the Scottish Dialect; responses to Burns’s subsequent retreat from the spotlight; the critical construction of his posthumous reputation; how poets (mostly Scottish, but also English and Irish) addressed his legacy in the two decades after his death; and finally, a very special instance of the latter category, the self-fashioning of James Hogg as Burns’s successor. Andrews thus restricts himself to Romantic-period literary responses rather than discussing the Burns ‘cult’ which increasing shaped the popular perception of Burns as the nineteenth century progressed; very wisely, as he has more than enough on his plate as it is. It is often observed that Scottish Enlightenment ideas of human nature primed late eighteenth-century culture to recognise Burns within its own terms of reference. Andrews examines one of the most important of those terms, ‘genius’, as it appears in the philosophers from Hume to Blair. In this account it is very striking that ‘genius’ seems most commonly used in these writers to name the particular talent or capacity of any individual (an early essay by Hume uses ‘genius’ to name the ‘natural parts’ needed to make a good lawyer of doctor, for example), or indeed of a people or a nation: Scotland has a ‘genius’ which (the usual story goes) was suppressed (in the civil wars) but is now flourishing (since the Union). Kames seems to have been an early adopter of ‘genius’ in a more specialised sense, to mean an aesthetic sensibility ‘allied to a warm and inflammable constitution’; the subject of William Duff’s Essay on Original Genius (1767) is poetic inspiration, acting spontaneously and independently of literary conventions or training. It is in this latter sense that Burns could be hailed as ‘genius’, a ‘heaven-taught ploughman’, his authenticity as a bard guaranteed by his lack of literary education, in many of the reviews discussed in chapter two of Andrews’s book. This chapter also reminds us, very usefully, that at least one critic, John Logan, immediately spotted this for the nonsense that it clearly was, simply on the evidence of the literary allusions and imitations of the Kilmarnock Poems themselves, and Francis Jeffrey and Walter Scott would forcefully amplify this point in the following century. Andrews’s title, The Genius of Scotland, might suggest an interest in the interaction between the ‘genius of the nation’ as understood by William Forbes or Adam Ferguson, and the poetic ‘genius’ ascribed to Burns, as a way of explaining how Burns came to be elevated into the national icon that he remains to this day. But this theme is not developed. Partly this is because this book does not venture later into the nineteenth century when this elevation reached its most extraordinary heights. But partly also it is because Andrews has been primed by his reading of Pierre Bourdieu to find other ways of framing his discussion. It is from Bourdieu that Andrews gets the phrase ‘Cultural Production’ in his subtitle, and his discussion of the Enlightenment philosophers in chapter one is geared towards finding in them anticipations of ‘genius’ (in whatever sense) understood as a social category rather than a fact of nature. The Genius of Scotland is at its most interesting when it invites us to think about the use that critics and commentators made of Burns’s ‘genius’, and the ways in which their recognition of him as a genius served to legitimate their own critical discourse. But this is only half the story. In works such as The Field of Cultural Production, Bourdieu argues that a work of art is constructed in anticipation of, and in an attempt to win, this critical recognition, by advertising its knowledge of its culture’s aesthetic codes. Andrews is illuminating on the way in which Burns’s framing of his work participates in this dialectic between ‘knowledge’ and ‘recognition’, but rather leaves to one side the question of how the subject matter and form of the poetry itself is shaped or chosen to the same end, or indeed that the subject matter of at least some of the poems is a dialectic between knowledge and recognition in something like Bourdieu’s sense (Andrews’s comments on ‘The Twa Dogs’ points in this direction). Similarly, Bourdieu’s conception of the knowledge deployed in works of art and their reception as ‘cultural capital’ is thoughtfully introduced here, but could only really gain critical leverage if articulated in relation to the actual capital deployed in the production of books, that is, if artistic production and reception were put in relation to the material and economic context which makes them possible. This has been very well explored in the case of Burns’s Poems by Richard Sher in The Enlightenment and the Book; there is no room for Andrews to go into it here (though it is intriguing that many of the poetic tributes discussed in chapter five are by printers). In The Genius of Scotland the focus on reception, and the relative absence of both the economic context and of detailed discussion of the poems themselves, actually leaves Bourdieu’s ideas very little work to do. Indeed, the economic circumstances that made possible Burns’s book are so generally known, at least in broad outline, that it might be more useful to write a book using the case of Burns to explain the ideas of Pierre Bourdieu, rather than vice versa. The chapters on the posthumous reception of Burns have even less of a role for Bourdieu but, as with the earlier chapters, the material discussed is so suggestive that this is no great loss. What emerges very strongly here is the extent to which the major topoi of this reception remain variations on the Enlightenment version of ‘original genius’: Burns’s destruction by his own excessive appetites (Kames’s ‘warm and inflammable constitution’), and neglect by potential patrons (the ‘ploughman poet’ must remain in the imagination as a ploughman poet, untroubled by the fact of a potentially lucrative career in government service). Indeed some of the poems quoted here on this latter theme seem to echo Burns’s own poems on his predecessors. When, in 1797, William Roscoe denounces ‘Th’ unfeeling great / Who knew thy worth, but hastened not / To sooth thy fate’, he is repeating Burns’s complaints about the treatment of Robert Fergusson (‘Curse on ungrateful man that can be pleased, / And yet can starve the author of the pleasure!’) and James Thomson (‘They, wha about thee mak sic fyke,/ Now thou art but a name, / Wad seen thee d—n’d ere they had spar’d / Ae plack to fill thy wame’). That Thomson was in fact one of the eighteenth century’s most successful operators of the patronage system brings home the extent to which this is a topos of sentimental literary elegy, with no necessary connection to the actual circumstances of the poet who is being mourned. Here is a point that might be interesting to cast in Bourdieu’s terms: one of the things a poet can know as a means of gaining recognition is that true poets must, in their lifetimes, have been denied that same recognition; and perhaps this is one of the ways in which a capitalist system of cultural production avoids recognising itself as a system. As the list of chapters at the start of this review perhaps suggests, at least three books would be required to fully deal with the material introduced in The Genius of Scotland, and one of those would be dedicated to the subject of its last chapter, James Hogg’s appeal to Burns as both precedent and rival. There are some niggles in presentation: Habbie stanzas have all lines left-justified, without the characteristic setting-in of lines four and six; and I am not sure what end is served by so consistently italicising ‘genius’. But this book remains an invaluable account of a fascinating area, from which even longstanding students of Burns will learn a great deal. The Genius of Scotland: the Cultural Production of Robert Burns, 1785–1834 by Corey E. Andrews is published by Brill, 2017, as part of the series Scottish Cultural Review of Language and Literature (SCROLL).